It was quite a day for Somdev Devvarman as this year's NCAA singles champion also became the first player since 1998 (Pavel Kudrnac) to win the singles and doubles. 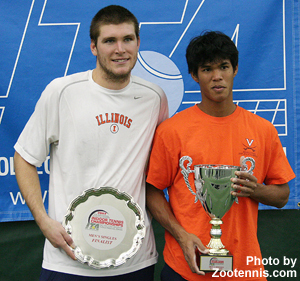 Ryan Rowe was the third Illini in five years to make the ITA Indoor finals following Amer Delic (2002) and former teammate Ryler DeHeart (winner, 2004). The senior put up quite a fight and the first set was some of the best tennis I've seen in awhile. There were no breaks, incredible winners, impossible gets and unbelieveable dropshots. As the tiebreaker was played, however, Somdev went deeper into perfection. Despite watching 12 aces go by him during the match, he came back tougher to take the breaker 7-2, and the second set 6-2. I'm sure these two will meet again during the season and I hope I get to be there! After a break, Somdev was back on the court with partner Treat Huey to face the doubles team of Robert Farah & Kaes Van't Hof -- whose father Robert Van't Hof was an NCAA doubles champion -- from Southern California. 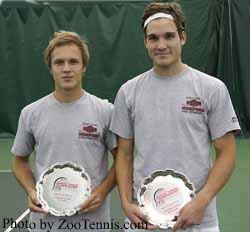 The Virginia duo got off to a slow start, as some great play by the Trojans got them into a 4-1 hole. They came back to life and won the next five games to take the set at 6-4. The second was a good doubles display with the first break coming at 4-3 and the Somdev Devvarman had his second trophy of the day with another 6-4. Unseeded Aurelija Misceviciute of Arkansas went home Sunday with that school's first ITA Indoors title after defeating Ani Mijacika, the fourth seed who was also a finalist at the Riviera All American. It was one of those matches that you had to be at to write about. The final score was 6-3,5-7,7-6(3), but it didn't really have as much excitement as the numbers might show. 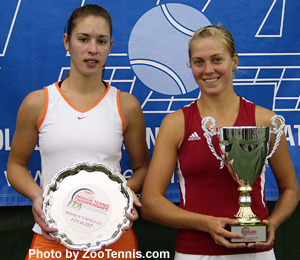 The points were short and there were more errors than winners from these two players. I had seen a lot more out of each all week, perhaps they were worn out, and look forward to seeing more from them in the future. 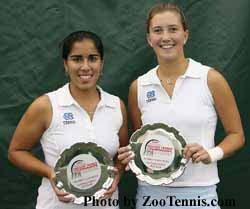 There was no lack of excitement during or after when Kelcy Tefft & Brook Buck won their first national collegiate title. 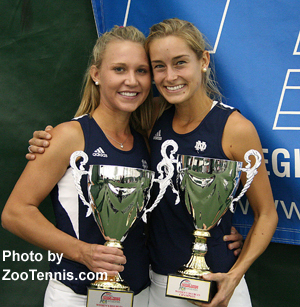 The Notre Dame duo, who have been playing together for 10 years and won five major junior titles together, put on a great display against the Baylor team of Lenka Broosova & Zuzana Zemenova. The 6-3,6-1 match was definitely a crowd pleaser. In consolation play, the last hope for an Ohio State trophy -- they've gotten at least one every year the tournament has been here -- faded with Bryan Koniecko's 6-1,6-2 loss to Dominic Inglot of Virginia. The match was a combinaton of great play by Dominic and exhaustion by Bryan, who had pulled out a tough win Saturday over Robert Farah (6-7(9),7-5,6-4). The women's consolation singles was an all-Northwestern affair with Georgia Rose starting out leading 5-1 and eventually bowing to teammate Maria Mosolova, 7-6(4),6-3. 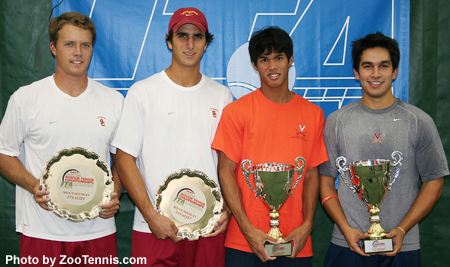 The ITA Indoors is moving next year to the University of Virginia. It's been a great three years here and Toledo Coach Al Wermer, Ohio State Coach Chuck Merzbacher as well as the staff & volunteers at the Racquet Club of Columbus and Ohio State Men's Coach Ty Tucker deserve a lot of credit for running things so smoothly again this year.